The Tunisian range of mosaic tiles features multiple patterns. All are handcrafted from beautiful coloured stones and marbles gathered throughout Tunisia. The pieces are cut into slices and then into the required shapes, then placed onto each pattern by local artisans. 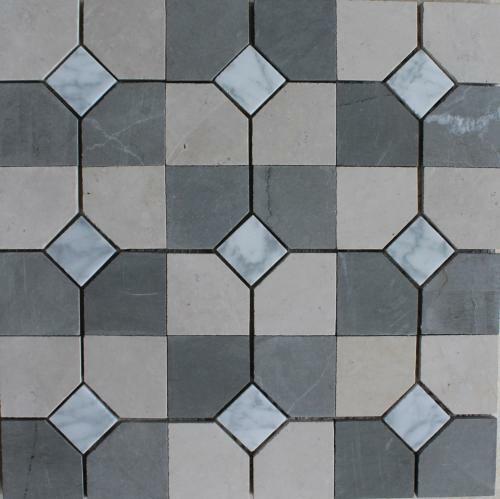 The result is a discerning range of authentic stone mosaics, colourful or plain, full pattern or border pattern, textured or smooth, for decorative walls and floors that will enhance any space and wear naturally over time. The Tunisian range is suitable for both commercial and residential, indoor and outdoor areas and is particularly striking in large spaces such as entry foyers, kitchens and protected patio floors. All designs are handmade, unglazed, with a desirable soft matte finish. Sealing is recommended.